The thing about going on vacation is that the relaxation only begins when you arrive. Everything leading up to that is a whirl of admin and organization. Where should you stay? Where will you eat? How are you going to get around? What kind of tours and daytrips should you book? Here’s an insider tip from this well-traveled manatee. Book your accommodation at a vacation rental instead of a hotel and you’ll be able to cross most of those questions off your list! “Wait, what’s a VRBO?” you’re asking. VRBO (sometimes VRO) means “Vacation Rental by Owner” and it refers to properties used by an owner or property manager at some times during the year – but that can be rented out by travelers at other times. So why are VRBOs so great? Plenty of reasons. For one, they’re generally more affordable than their hotel equivalents. Plus your booking applies to an entire home, not just a room or a suite in a hotel. That means you have easy access to amenities like a kitchen, a laundry and the property grounds. Vacation rentals also give you a whole lot more flexibility. When you have a whole house at your disposal, you can travel in groups more easily. Kids have more space to play and roam – and feeding them is a lot easier when you’re not reliant on room service! As an added bonus, it’s often possible to find a VRBO in areas with few or no hotels, or where everything is already booked up. One of the great things about a VRBO is that you’re not insulated from the local lifestyle like you are in a hotel. You’ll be staying in someone’s home rather than on a strip aimed at tourists, meaning that you’ll get to immerse yourself more readily in the local culture. That feeling of “connection” is even easier to achieve when you have great hosts. (The people are what make a great vacation, after all!) When you book a VRBO you’ll often be able to get personal recommendations on local restaurants, events, activities and daytrips. This is a lot more valuable than the potential hit-or-miss of an online search! Different vacation rentals do things different ways – which is all part of the experience. 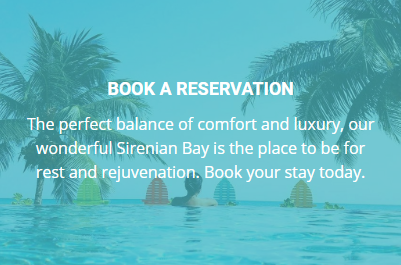 At Sirenian Bay, we’re all about making it personal. We want you to experience our home as your home, and we’ll do everything we can to make sure your trip is a memory-making one. That’s why there’s always someone at hand to help out, answer questions or assist with organizing and planning. We can cook for you, or let you be the chef if that’s what you prefer. Maybe you want a massage or need a lift into town. Perhaps you need some pointers on fishing or snorkelling. Whatever you have in mind, we’re here to make it happen! So the next time you’re booking accommodations, opt for a VRBO over a hotel. Why have a place to stay when you can have a place to call your own?